Source: INSTRUCTION BY MARLA APTFROM TADASANA (Mountain Pose), jump the legs wide apart and extend the arms to the side to make a T, so that the feet land directly under the hands. Turn the upper arms out, palms up, and raise the hands overhead. Lift the sides of the torso toward the fingers while moving the shoulder blades forward to support the lift of the chest. If you can keep the arms straight, join the palms together. Turn the right foot out 90 degrees; turn the left foot and leg strongly inward. 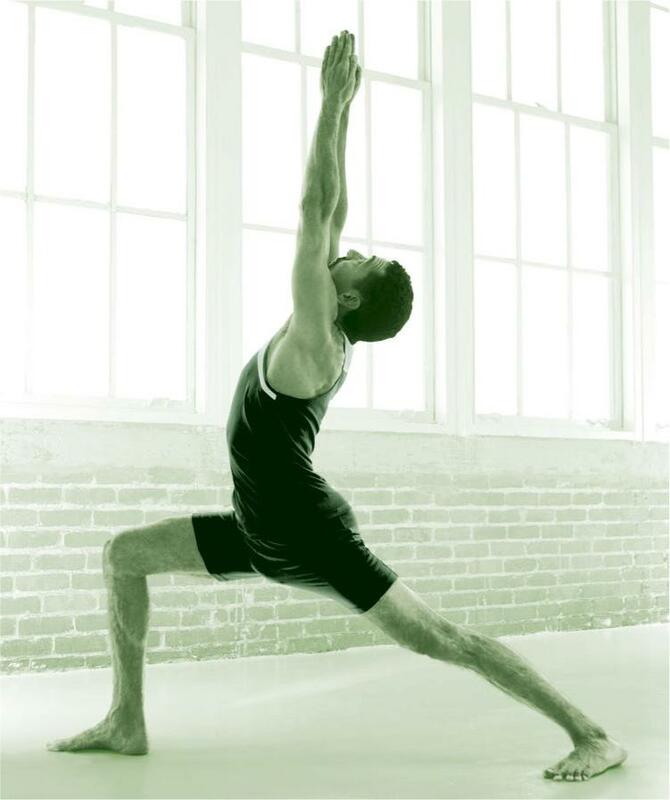 Exhale and turn the hips and torso to face the right leg. Bend the right knee to a 90-degree angle, keeping the knee aligned directly over the ankle. Press the back edge of the left heel into the floor and straighten the left leg. Internally rotate the left leg so that the outer thigh rolls forward as you bring the right thigh parallel to the floor. Let the top of the right thighbone descend as you lift the front of the pelvis and abdomen up toward the chest. From the left back ribs, turn the left side of the torso forward. Lift through the sides of the rib cage, the armpits, and the sternum as you look up toward the ceiling. Many yogis, especially beginners, feel genuinely embattled in Warrior I by its persistent tug-of-war between extension and compression, twist and backbend, internal and external rotation, and strength and flexibility. When viewed this way, the pose is about the triumph of the spirit, a universal theme in yoga. Take Warrior I with understanding and intention, and you are a warrior, ready to fight the good fight. Like much of asana, the pose comes in many variations. Though the details differ from style to style and yoga class to yoga class, the energy remains the same. Here, five celebrated teachers from different traditions share their own instructions and insights to help you deepen your understanding of the pose so that you can access the power of the warrior within you.